Before I started my research for this article, I had already outlined it in my head. An introduction highlighting the 160th birthday of the passenger elevator followed by a short summary of our own first passenger elevator. As I explored the history of the first Capitol Hill elevator, I soon discovered its location was a mystery. Given our current detailed record keeping of projects, it's hard to imagine a time when such a historic moment passed with so little fanfare. Today, preservation consumes the work days of many Architect of the Capitol (AOC) employees. Projects large and small are carefully documented in detail to ensure the historic integrity of the Capitol campus is not lost. 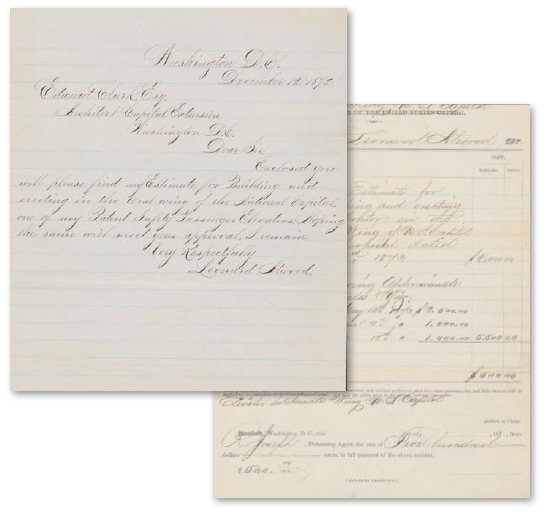 Future generations will be able to learn all about our modern-day projects, but unfortunately, as I learned, detailed record keeping was not high on one's priority list in the 1800s. Where to begin when searching for historic facts? In 2017 the answer is Google. It led to our own website, www.AOC.gov, and my first clue: "In 1873 the first elevator was installed..."
I had a year, but not much else. I skimmed a few books about the history of the U.S. Capitol and learned that the first elevator was installed in the Senate Wing, but nothing detailed its exact location. I would have to leave Google and modern research to return to a time when paper was king, and no one has more paper than the Records Management and Archives Branch. I spent hours carefully sifting through letters, newspaper clippings and vouchers from the 1800s. 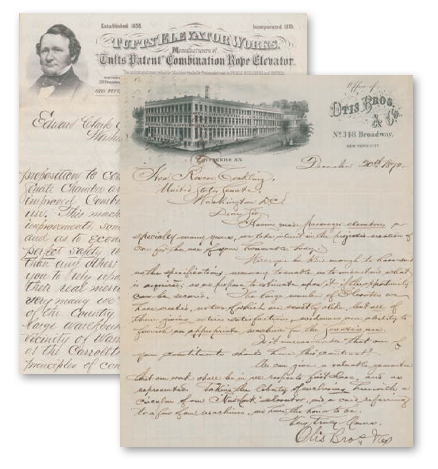 Correspondence dating back to 1871-1873 (above, left) revealed obvious interest from several companies hoping to be chosen to install the prominent building's first elevator. In the end, Leonard Atwood was awarded the contract. Records (above, right) show the total cost of installation was $8,259.21. While records related to the elevator's expenses were meticulously kept, its exact position remained a mystery. I read Glenn Brown's "History of the United States Capitol" and found my next clue: "For a discussion of the historical development of elevator service in the Capitol, see… Annual Report of the Architect of the Capitol for the Fiscal year Ended June 30, 1934." That seemed promising, but where would one find these reports? Perhaps the Curator would know. AOC's Erin Nelson (left) and Vicky Villano search the Architect's Annual Reports for clues to the location of the U.S. Capitol's first elevator. 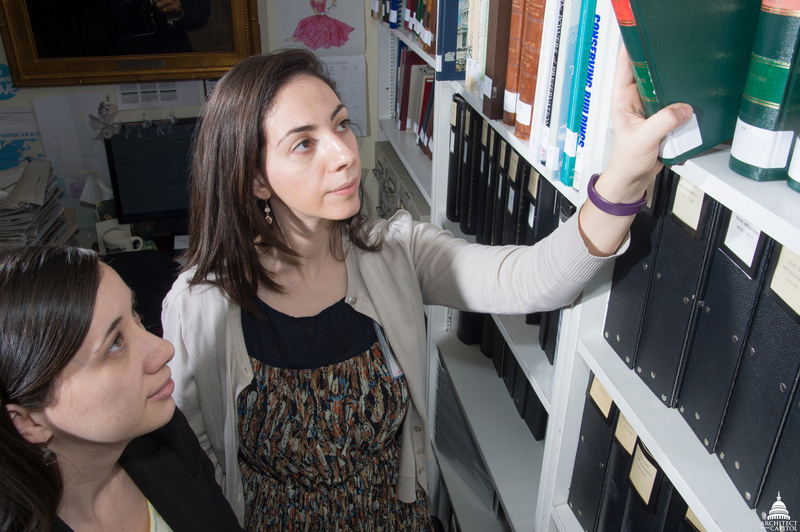 Standing in the Curator's Office, Vicky Villano, Curatorial Assistant, pointed to the books behind her desk. The annual reports lined several shelves, starting with the very first one published in 1850. She had already pulled the 1934 report and marked the section on elevators, which stated that previous reports had not covered elevator service in great detail. In an attempt to capture the history of elevators, the 1934 report had included a summary of elevator references and their history. The first elevator reference did not appear until 1876, which details the unbearable noise the screw elevator caused when running and, due to the noise, was replaced with a hydraulic elevator. It's location: "Senate Wing." Another dead end. AOC's Scott Luketich searches records from the Elevator Division. I know very little about elevators, but thought it might be possible for a remnant of a screw elevator to still exist. I turned to the Capitol Building's Elevator Division. Scott Luketich, Supervisor of the Capitol's Elevator Division, informed me that any elements of past elevators would not have survived, but he had a guess for the first elevator's location. "I believe it would have been elevator S1. I will do a little more research and let you know if I find more information," he said. The Elevator Division's records only went back to 1957 — a long way from 1873. Luketich and I returned to the Curator's Office to see if we could narrow down the U.S. Capitol's footprint in 1873. With the building's extensions completed in the 1860s, we weren't able to narrow down our search area by much. Curator Michele Cohen took another look at the 1934 annual report as Luketich unrolled his map of elevators. The report gave enough details to guess the location of elevators installed in the 1880s, but the location of that first elevator remained out of reach. Erin Nelson, Michele Cohen and Scott Luketich review old floor plans. "What about floor plans?" Cohen asked. I had not seen many floor plans in the archived files, and the ones I had seen did not include elevators. 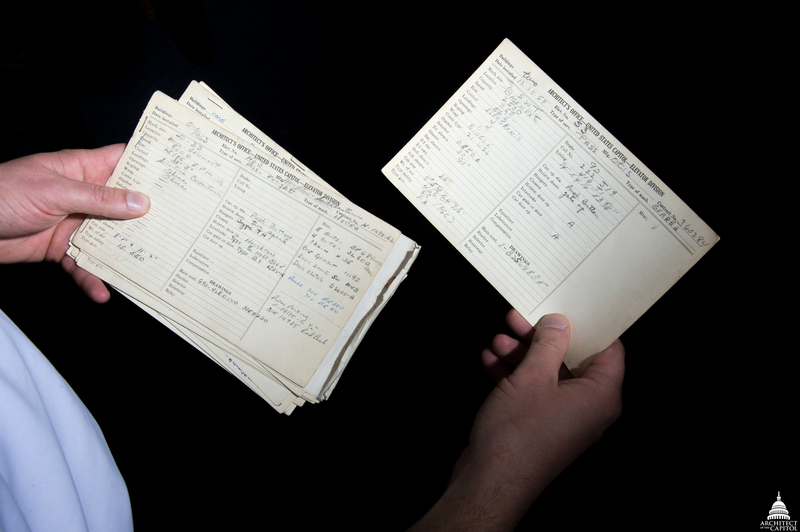 She pulled a black binder of historic floor plans from a shelf directly under the annual reports. 1871, 1872. There was no floor plan for 1873. At this point, I felt like my search might be nearing its end. 1874, 1875, 1876. No elevator reference. I decided to keep going until I found the first one. Perhaps I could then narrow down the list — but I wouldn't have to. 1877. There it was. The only one. The first one. 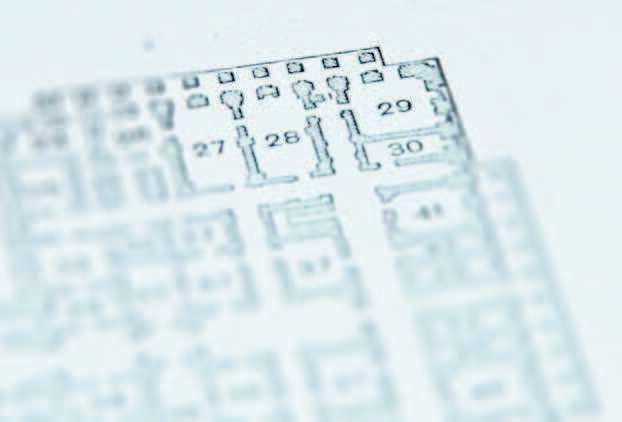 This 1877 floor plan shows the location of the first elevator on the Capitol campus marked with a "31." Luketich and I searched for 31 on the map of rooms. At first glance and after an even harder second look, it appeared to be missing. And then I saw it. The number, far smaller than the other room numbers, was almost hidden away in a hallway corner. "The location of 31 is S1," Luketich said. His assumption had been right from the start. It's hard to imagine the U.S. Capitol Building without lights, heat, air conditioning and elevators, but plans for the building were made without those items in mind. Adding them in required a disruption of the spaces they would occupy, though one would never notice today. S1 begins at the basement level near the Senate Carry Out. As it climbs up to the third floor, it occupies space that once included hallways, a Minton tile floor and a window overlooking the National Mall. 31, or S1 as it's known today, was added after the U.S. Capitol Building was built, covering the window that still exists at what was once the end of a hallway. 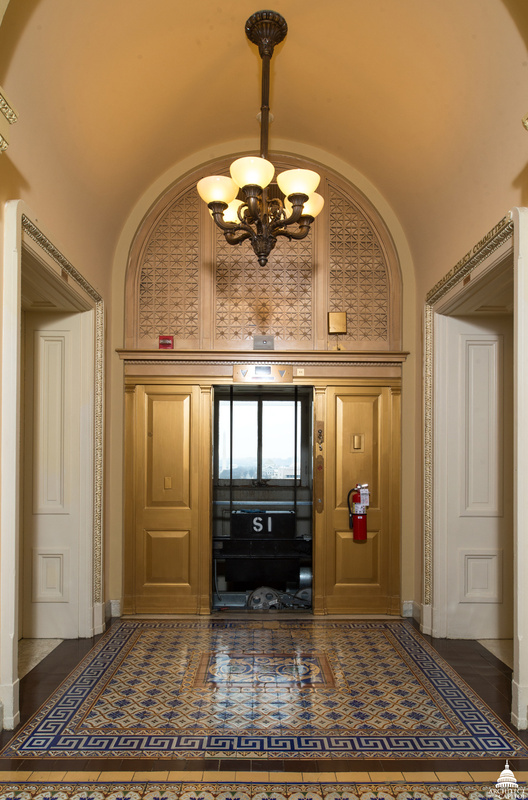 History may have relegated our first elevator to a simple "31" on an old floor plan, but elevators are now a central component of U.S. Capitol Hill buildings. Today, the Architect of the Capitol maintains 330 elevators across the campus, and it's hard to imagine our buildings — and work days — without them. The U.S. Capitol Building has continued to expand and evolve over the decades, allowing for the installation of modern conveniences while remaining one of the world's most iconic structures. 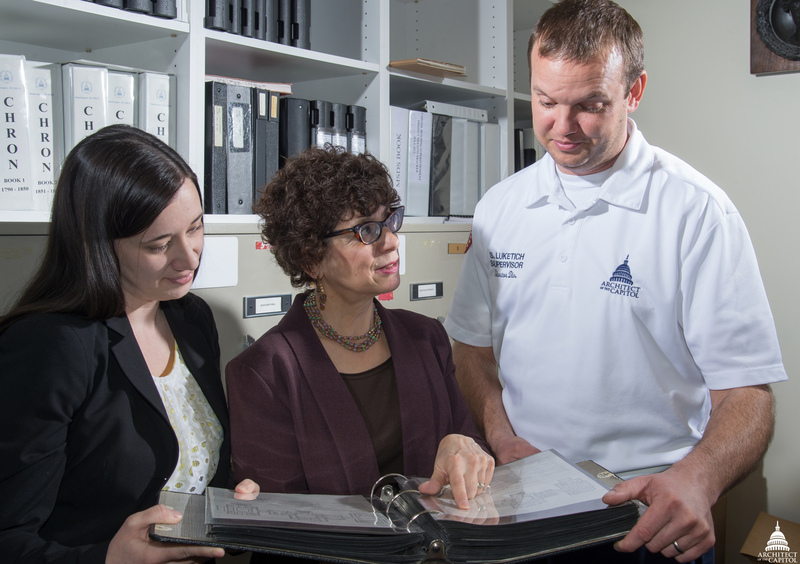 Working on Capitol Hill often provides AOC employees with a front row seat to the history unfolding around us. It's easy to forget there is so much more history tucked away — in long forgotten reports, walls and even an elevator shaft — just waiting to be rediscovered. Very interesting, Erin! You are quite a sleuth! I am a teacher and wanted to know if the 365 steps in the Capitol building were a coincidence or they were meant to represent justice every day of the year? Hi Dalia, the numbers of steps in various locations in the Capitol were determined for aesthetic and practical, rather than symbolic, reasons.